There’s a building being built in Oslo right now. It’s going to be the new Edvard Munch museum and it’s a high-profile project in Norway. It is designed by Spanish architects Herreros Arquitectos who have collaborated with local office LPO arkitekter. One of the guys organizing the construction process of the new Edvard Munch museum is Øyvind, and he’s a really nice guy. One of the reasons why I like him so much is that when he has problems with his building information modeling tools, he picks up the phone and calls the Bad Monkeys. Just like he did last year. Last year Øyvind needed to coordinate the manufactured façade panels with the intended designed panels. The façade manufacturer Skandinaviska Glassystem (SGS) modeled all the panels for production in 1:1 (think LOD 5.000.000.000) in Solidworks and the architects designed the building in Revit. Solidworks could export IFC that Revit could link, but the panel models were not referenced to the building coordinates because they were modeled for production. Jakob, one of the brilliant engineers at SGS, exported 300 IFC files, barely covering the base of the building. 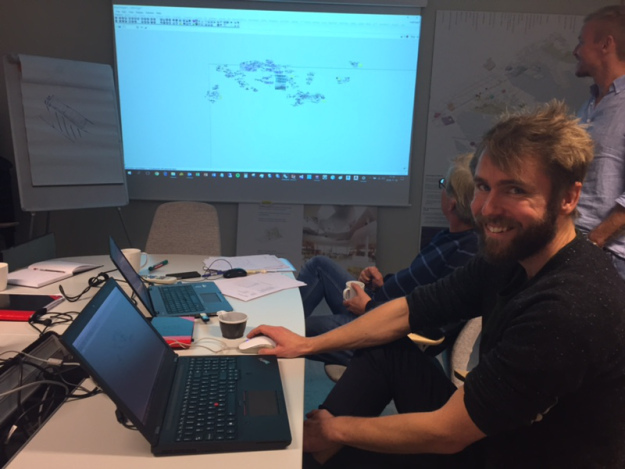 Along with the IFC-files, which were totaling more than 1.5 GB, he mapped the placement and orientation of each part with Grasshopper and produced an Excel spreadsheet with file names, coordinates and vectors corresponding to each panel type’s intended location and orientation. Most of the IFC-files were repeated multiple times across the façade. 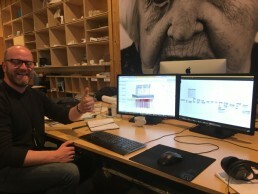 For this small part of the building Øyvind needed to coordinate 3000 highly detailed façade panels with an already extraordinary amount of architectural, structural and technical BIM data, so, he called us. What a great guy. Jakob Brusewitz at SGS mastering Grasshopper during a meeting with Øyvind and others. Nice guy Øyvind Børstad from ÅF Advancia mastering Dynamo with his eyes closed. I got Dimitar Venkov on board and we started working on a Dynamo based workflow. I’ll spare you the details, but in short we created one Dynamo script that grabbed all the IFC-files in a folder, mapped and copied them around by file names, coordinates and vectors, directed by the Excel spreadsheet. Dynamo then imported the IFC geometry and pushed it to Revit as Direct Shape elements, using the same type of geometry that Link IFC utilizes. Using this lightweight geometry was the only way we could think of bringing to Revit without melting all computers trying to work on the models. All the imports worked perfectly, and even though we had to minimize any visual fidelity in the views showing the imported data (no anti-aliasing, no shadows, only Shaded with no edges, and so on), the project team could perform highly detailed quality assurance/coordination between the design and fabrication models. 1. Close up of “Klumpen” - a 40 MB IFC file no bigger than a football. 2. Close up on one of the corners. 3. Revit model after import. 2950 highly detailed IFC imports, automated with Dynamo by Dimitar Venkov. If you want to be a nice guy, like Øyvind, give us call. We’ll make your computer fly and teach you how we do it. 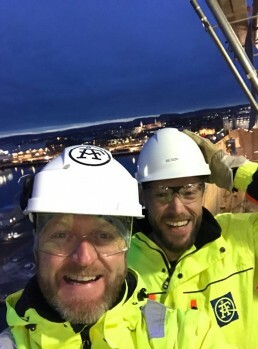 Øyvind and me at the top of the slip forming right before Christmas.